Imagine a 50 year-old taxi driver in a beat-up but recently washed taxi. He’s pulled over to the side of the road and has nodded off under a dark, gray sky; a hallmark of a Buenos Aires winter. He has abandoned his thermos and mate; little green yerba leaves and lukewarm water have spilled onto the empty passengers seat. His body is bent over and his arms are folded to protect him from the freezing air. His head rests against the cold window where condensation accumulates as he breathes gently onto it. He only wakes up to cough, and then curses at the disturbance. Suddenly, a ray of sunlight pierces through the window and the taxi driver bats open his tired eyes. Without a moment of hesitation, like a bear awakening from his hibernation, he squints, smiles and unfolds into a full-body stretch. He revs the engine, dusts off the dashboard, and begins the first day of the rest of his life with a renewed energy and a refined sense of hope. 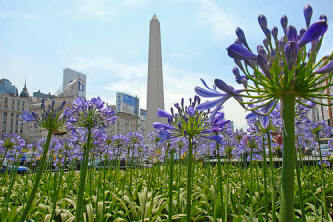 This is how spring arrives in Buenos Aires. The Buenos Aires winter may not be as frigid as in many other countries, but the way the Porteños (the citizens of Buenos Aires) complain, one would think they were in the Arctic Circle. 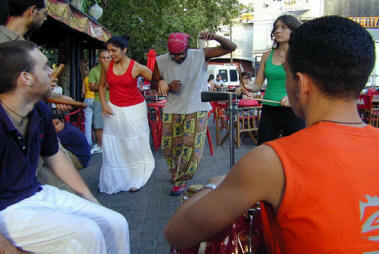 The “queja,” or the complaint, i s also a Buenos Aires hallmark. In winter, the queja is extreme, while the weather might not be — which also introduces the queja’s best friend: exaggeration. While Porteños are busy hibernating and planning for the worst, deep inside they hold a shiny yet beat-up hope for the fateful day when, although it may still be cold, they can shake off the bitterness of winter and celebrate the holiday of Spring. 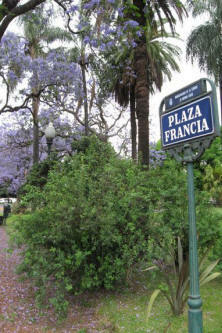 Yes, that’s right, Argentineans celebrate a holiday aptly named “Day of Spring” which falls on September 21st. However, there is another important holiday that comes first — on the second Sunday of August — and kicks-off the initial recognition that Spring is coming: “El Dia del Niño,” or Child’s Day (to increase the national spending, a popular tactic in Argentina is to promote obscure holidays associated with gift-giving). On this day, the responsibility of giving falls on the godparent’s shoulders and gifts are expected, if not demanded. Fortunately, by Argentinean law (one that is actually abided by), all employees must earn 13 months of salary a year; the extra month of cash given in two parts: one half in July, the other in January. For many people this bonus is a sign of Spring, and our friendly taxi driver, with his new lease on life, is no exception. He jumps into his car and goes to buy a new soccer ball for his godson or a relatively expensive, imported Barbie for his goddaughter. Blue-collar workers who have sucked it up all winter retreat to their happy napping spots on sunny plazas and eat their lunch, laughing with friends on a park bench. It’s springtime; things are good. For the college-aged crowd (which covers ages 20 – 35 due to undergraduate college careers that commonly stretch seven to eight years), Spring is represented by a huge sigh of relief. Final exams are over, indoor concerts move outside, and students still stuck living at home can get respite from a nagging mother by heading out into the cool, Spring air. One key social group that cannot go without mention during the “holiday” season is the wealthy upper class. While the rest of the population generally resent them, the rich families show us foreigners how to appreciate winter and celebrate Spring Day in style. The “chetos,” or upper class, welcome the Spring by lowering the central heating in their mansions, pulling out their fancy cars, and moving their tennis matches to outdoor courts. This, following their return from ski vacations surrounded by some of the Earth’s most beautiful landscapes. 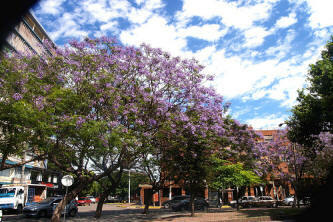 Having the ability to escape the gray winter in the city is one that very few citizens in Argentina can enjoy. However, those that do have that luxury tend to jet-set it over to such fashionable getaways as Bariloche or Mendoza where they hit the slopes by day and then spend the evening hours relaxing back at the lodge in their in-suite Jacuzzis. All Porteños welcome September 21st, this is after all a national holiday — no school, no work. amilies get together and celebrate with an “asado,” or BBQ and quality time — but for the crowded niversity group, the plan is a little different. Dia de la Primavera also happens to be “Dia del Estudiante,” or Student’s Day. It is the first national holiday of the school year and certainly is taken advantage of. All of the bubbling anticipation of Spring erupts into one of Buenos Aires’ most reckless and hilarious parties of the year. Classmates spend this day partying hard in beautiful plazas, singing, getting drunk and beating the queja of winter out of one another. Though Argentina’s many social classes and age groups tend to be focused on their own daily regimen, they all celebrate and welcome Spring with an energetic sense of progress and calm. For the taxi driver, the med student and the desperate housewife, Spring has arrived, the queja takes a temporary pause, and this fantastic city is alive again after an absolutely freezing, painful, bone-chilling, and of course, exaggerated winter.